Read the Press Release about our exciting App created by Julie Savarino - Click here! Lawyers and law firm marketers are increasingly mobile and short on time. Julie Savarino created the Rainmaker Coach App so that whether working from home, at other offices, on the road, in meetings, attending conferences or events, they have immediate access to information/tools that can help make the most of time spent trying to develop new business. Lawyers from Am Law 100-200 law firms, mid-size, boutique and small law firms have purchased the Rainmaker Coach™ App: Jones Day, Weil Gotshal, Paul Hastings, Alston & Bird, Morgan Lewis, Latham & Watkins, Husch Blackwell, Kelley Drye & Warren, Hogan Lovells, Barley Snyder, Nossaman, Varnum, Manatt, Nexsun Pruet, Bailey Kennedy, Wong Fleming, Sussman Shank, Carlton Fields, among many others lawyers and in-house law firm business development professionals. Click Here to view an in-App listing of our latest Checklists! This App also provides the ability to take notes by typing or dictating: things to remember to do, lists of whom you met/spoke to, conversational details and/or follow-up reminders. You can then email these notes to yourself and/or others. Rainmaker Best Practices Tool Kit - Click Here! Rainmaker Coach™ App was a finalist for a 2013 'Your Honor' Award by the Legal Marketing Association's Midwest Chapter. Rainmaker Coach™ provides an instantaneously accessible source of immediately useful information, including "Top 10" tips and tools to help make the most from common business and client development situations. This App can help improve business/client development planning, implementation, scheduling, follow-up and reporting and help create an increased stream of new business. Download Rainmaker Coach™ from iTunes now! Click here to view a selection of sample screens. The current version 1 of the Rainmaker Coach™ includes twelve checklists "Top 10" tips of what to do when: attending a meeting, lunch or dinner; presenting at a conference or seminar; and attending a conference, seminar or event. This App also provides the ability to take notes by typing or dictating: things to remember to do, lists of whom you met/spoke to, conversational details and/or follow-up reminders. You can then email these notes to yourself and/or others. 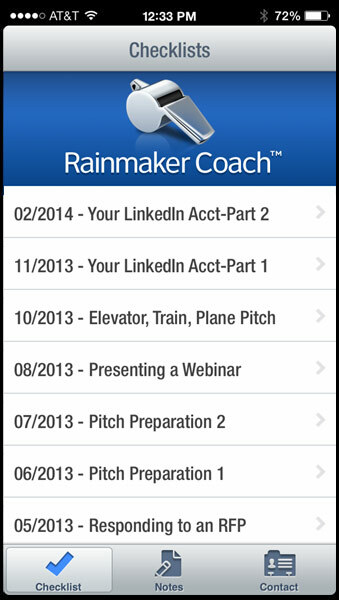 What exactly is the Rainmaker Coach™ app? What does it do? "It's about time someone created an app designed to help lawyers develop business! This Rainmaker Coach™ will help lawyers in all types of firms make the most of their time and efforts to develop new work." "As a former law firm partner with practice group and client development responsibilities, I think this Rainmaker Coach™ app is extremely handy and useful. As is common for many busy lawyers, I would rush to business development meetings without having adequate time to prepare. This app allows me to take two minutes to prepare right on my iPad® and to take and send myself notes to insure that I follow-up. I recommend the Rainmaker Coach™ highly for all lawyers who are short on time and need to develop business and client relationships." "This app is great because it gives me another tool in my "tool box" to help lawyers maximize the results from their new business development efforts. It also gives me a place to go to get refreshers as needed and I can take and send notes/reminders to myself and members of my team as appropriate". For more information about the Rainmaker Coach™, please contact Julie Savarino by email at Julie@BusDevInc.com or telephone (734) 668-7008. For App support, please email App@BusDevInc.com or call (734) 668-2099.